I used MAC Vestral White as a base, with ULTA Moody Blue for the tips, and ORLY Candy Cane Lane for the anchors. Applied the bullions when the first coat of Seche Vite top coat was still wet, then topped it all off with another coat of Seche Vite top coat. This is really cute. I love the little anchor made of balls. I am like you. I don't like adding things to my nails that stick out. I hate even having nail polish on that is too thick. It drives me insane and I pick at it all day. I'm on the fence about adding embellishments to the nail. A rhinestone here or there is okay but I have that fear that if i have something on my nail that sticks out too much it might get caught on something and it'll rip the nail off. So cute! 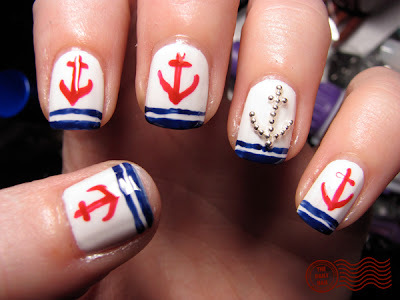 I love nautical-themed manis! Love this design. I love anchors! Love this! No, no picking! Glob on some topcoat and rub your fingertips over them as little massage instead. I love this so much! One of my favorite designs from you. Love those bullions, they really finish the design! I adore your nautical nails...absolutely adorable and by the way you have great nail beds....drop in and say hello...Dawn Suitcase Vignettes. What is link whoring? it had become attractive! My spouse and i treasured, I enjoy points sea.